Australian trumpeter/composer/sound artist, Peter Knight, is a multidisciplinary musician who has gained wide acclaim for his distinctive approach, which integrates jazz, experimental, and world music traditions. 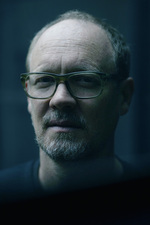 Peter's work as both performer and composer is regularly featured in a range of ensemble settings, he also composes for theatre, creates sound installations, and is the Artistic Director of one of Australia's leading contemporary music ensembles, the Australian Art Orchestra (AAO). Perpetually curious, Peter's practice defies categorisation; indeed he works in the spaces between categories, between genres, and between cultures: 'Hard to categorise… hauntingly memorable' (The Wire, UK). 'Falling into an utterly genre-less wormhole' (Cyclic Defrost). 'Honest, inventive and original' (Hour Magazine Montreal). 'A serious work of stringent originality' (BBC Jazz on 3). 'If trumpet is an element then Knight is an alchemist' (New York City Jazz Record). Peter's role with the Australian Art Orchestra sees him touring regularly with the group both in Australia and abroad. He also commissions new work for the ensemble and curates a range of innovative programs for large and small settings. Outside of the AAO Peter performs regularly as a solo artist developing a distinctive modality for trumpet and electronics under the moniker, Allotrope. Other current projects include: Daughter's Fever (see: Youtube), featuring Melbourne alt folk luminary, Paddy Mann (AKA Grand Salvo); his celebrated cross-cultural sextet, Way Out West (see: Vimeo), with koto virtuoso Satsuki Odamura, and his multi-award winning running collaboration with theatre-maker Tamara Saulwick (Endings, Pin Drop). Peter has presented these and other projects at numerous venues and festivals with recent highlights including: Perth, Sydney, Melbourne and OzAsia festivals, Montreal Jazz Festival, Earshot Festival Seattle, Copenhagen Jazzhouse, Vancouver Jazz Festival, Aarhus Festival (Denmark), Café Oto (London), Melbourne Festival, Sydney Festival, MONA FOMA (Hobart), Dotolim (Seoul), Super Deluxe (Tokyo), Urban Guild (Kyoto), Earzoom (Ljubljana), Sonorous Duration Festival (Singapore), Veneto Jazz Festival (Italy), Teatro Municipal de Las Condes (Chile), iBeam (New York), Labor Sonor (Berlin), Cosmopolite (Oslo) and Totally Huge New Music Festival (Perth). Peter is also a member of Paul Grabowsky's Moons of Jupiter sextet, and performs regularly with a range of other artists and groups including recently: Paul Grabowsky (Nylipidgi), Dave Douglas (Fabliaux), Ensemble Offspring, and Clocked Out. As a composer Peter's recent commissions include Australian Art Orchestra for Metropolis New Music Festival 2016, Arts House Melbourne (for Festival Of Live Art 2016) with Tamara Saulwick: an audio visual work for 16 iPads called Alter. Vanessa Tomlinson for 8 Hits (percussion solo), the Australian Brass Quintet (Extended Brass Quintet), ABC Radio National (radio version of Pin Drop for Sound. Music. Word), Tamara Saulwick (various electro-acoustic scores), Big West Festival 2015 (Siren Call) Corpus (2015 score for Tina Havers dance company Bremen Germany), Kate Neal (wind and string quintet), International Trumpet Guild (extended trumpet quartet). Peter is the recipient of numerous awards and nominations including the 2016 Albert H Maggs Composition Award, a 2016 Green Room Theatre Award (with Tamara Saulwick), an Australia Council Music Fellowship (2013), two Bell Jazz Awards, Australian Music Prize (AMP, for Daughter's Fever), APRA/AMC Art Music Awards, Green Room Theatre (sound design), Australian Arts In Asia Awards, and AIR Independent Recording. He holds a doctorate from Queensland Conservatorium Griffith University and was awarded 2013 Alumnus of the Year. Residencies include, Banff Centre Fall Residency (2007) with the assistance of a Rolston Music Fellowship (Canada) and 2014 Music Omi (New York). Peter's work has also been supported by grants from the Ian Potter Trust, Australia Council for the Arts, Arts Victoria, Alan C. Rose Trust, Australia Korea Foundation, Australian International Cultural Council, and The Myer Foundation. In 2005 he was awarded the Keith and Elizabeth Murdoch Travelling Fellowship. Diomira : for chamber jazz orchestra (2016) Commissioned by Australian Art Orchestra.